GTA Online has decided to make this random weekend into a special one. They're upping the rewards for several multiplayer activities. 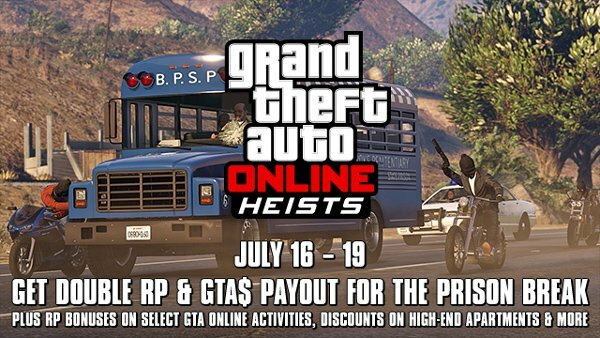 From now until July 19th, the Prison Break Heist will pay out twice the usual amount of Reputation Points and GTA$. If you haven't checked that heist out yet, you really ought to. The 4-player mission tasks players with breaking Professor Maxim Rashkovsky out of Bolingbroke Prison. Two players posing as a guard and inmate infiltrate the jail and grab Rashkovsky. Another player intercepts an incoming prison bus. The fourth criminal gets a plane and picks up his allies at a nearby airfield. High-end apartments aren't just pretty to look at. You'll need one to lead an online heist. If you're short on cash, I'd recommend buying Apartment 7 at Del Perro Heists. It should be only $150,000 thanks to this sale. Rockstar said that they're also going to offer limited-time discounts on select GTA Online vehicles and equipment. They'll make these announcements through their Twitter, Facebook and Instagram accounts. This bonus weekend follows closely on the heels of Ill-Gotten Gains Part 2, a free update to the game that added a number of new items. The new additions include a Marksman Pistol, the Dinka Vindicator motorcycle and Lampadati Toro speed boat. The first part of the update introduced a bunch of other high-end loot including the Pegassi Osiris supercar and solid-gold aircraft.